He was one of Britain's greatest record producers, a man immersed in the possibilities of sound at a time when studio facilities were still primitive. In fact, he built his own studio in his London flat, took artists and transformed a few of them into stars as well as making his own, often strange music. Best remembered for the global hit Telstar, he lived an odd, isolated life that ended in tragedy. 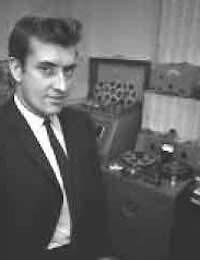 His name was Joe Meek, and he was a visionary. Robert George Meek (Joe to his family) was born in Gloucestershire in 1929. From a young age he was fascinated with electronics; as a teenager he built a television. Only to discover no broadcasts reached his home. He spent his National Service as a radar technician in the RAF, and once demobbed he moved to London, working as an engineer at IBC Studios, eager to bring his sense of sonic experimentation to a stodgy recording industry, before moving to Landsdowne Studios. But he wasn't cut out to work for others, and after being sacked from Landsdowne, he took the daring step of founding his own Triumph label, and releasing the futuristic I Hear A New World EP (which sold very few copies), before getting his first chart action with singer Michael Cox. Not long after, Triumph folded, but Meek then began independently producing master recordings and leasing them to labels - a business move decades ahead of its time. He set up his flat and studio (there was very little dividing line between the two) over a shop at 304 Holloway Road in London, christening it RGM Sound. Now he could truly experiment - and he did. He knew what sound he wanted, and had a good - if often unconventional - idea of how to achieve it. His first major hit came with the epic sound of John Leyton's Johnny Remember Me, with its sweeping echo. But overdubbing, altering, and tweaking sounds were part of Meek's arsenal, and what made his productions so identifiable - literally no one else could make a band sound like that. He was to British music what Phil Spector's "Wall of Sound" was to American pop. It spent five weeks at number one during a 25-week run in the charts, and as 1963 began it reached number one in the U.S., selling more than five million copies worldwide. It should have made Meek both rich and famous. But it didn't. Instead, a lawsuit charged that the melody plagiarized the theme to a French film, and remained unresolved at his death. It had been the high point, but it certainly wasn't the end for Meek. He'd go on to have a top five hit with Just Like Eddie, sung by Tornados bass player Heinz, and another global hit in 1964 with Have I The Right by the Honeycombs. However, they were the exceptions, rather than the rule. He became very paranoid and obsessed with the occult, which made for an unfortunate combination with his homosexuality, at a time when that was still illegal (he was arrested once for soliciting). By 1966 Meek had become quite withdrawn, and early in 1967 he killed his landlady with a shotgun before turning the weapon on himself and committing suicide. History has gone some way to establishing Meek's proper position in British recording history, but unfortunately he still remains undervalued.